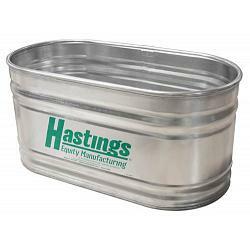 This is the Hastings 22GA Steel Round End Stock Tank, 2.5' x 2' x 8', 266 Gallon. Like the Hastings Black Label stock tanks, our Green Label stock tanks are manufactured with the same attention to detail and quality workmanship. To create a more price sensitive option, we use a 22GA sidewall on our Green Label tanks while still utilizing a 20GA bottom. This is the same quality of tanks our competetitors promote as a "20GA" stock tank because it has a 20GA bottom. These tanks have a one year warranty and the following features: G90 Steel throughout, 4-ply lock seams with containted sealant for maximum leak protection, .875" steel pipe rolled into the top of each tank to create a crush proof rim, long lasting zinc plated .75" one piece threaded plug assembly, also we have the largest selection of sizes available to meet your needs.